Drs. Michael and Kimberly Hoyt were strolling around Ashland, OR, in the late 1990s when they saw a charming two-story brick building for sale in the city’s Railroad District. Michael half-jokingly suggested that they ought to buy it, live upstairs and practice optometry downstairs. The couple were working for Medical Eye Center, a major ophthalmology practice in Medford, about 13 miles north, so the timing wasn’t right. But after 21 years at their jobs in Medford, the Hoyts left in 2014 to create Artisan Eyeworks, a stylish business in that same landmark building they’d eyed many years before. As optometrists in a busy medical practice, Kimberly and Michael each saw more than 40 patients a day. Now, they each serve no more than 10 patients in that time. The Hoyts obviously get to know patients a lot better, and they’ve become avid eyewear scouts, too. “We still practice the highest level of refractive and medical optometry,” says Michael. But now they spend just as much time “nerding out” on glasses, curating cool frame lines and finding the perfect pair for everyone who walks in the door. Their frame selections have proven a hit in Ashland, a somewhat isolated town of about 21,000 people near the Oregon-California border, a half-day’s drive from Portland. As home to Southern Oregon University and the nearly year-round Oregon Shakespeare Festival, Ashland is a college town that also draws many cultural tourists and growing numbers of retirees, yet there was little in the way of independently crafted eyewear. The Hoyts knew a niche when they saw it. Several niches, actually. For budget-conscious people and folks who like to buy American, Artisan Eyeworks offers a section featuring 132 “Made in the USA” frames, most priced under $200. Authenticity is the common denominator for these lines, which include Kala, NW 77th and Shuron, plus Randolph Engineering, a Massachusetts company that got its start making sunglasses for the U.S. Air Force. Meanwhile, folks looking for luxury lines won’t leave disappointed. This used to be an art gallery, after all. Now Artisan Eyeworks offers frames for faces from the likes of Anne & Valentin, Beausoleil, Blackfin, Etnia Barcelona, ProDesign and Shauns California. Add up-to-date exam technology including an Optomap retinal scanner plus a Zeiss iProfiler and iTerminal, and the Hoyts have positioned Artisan Eyeworks as the destination for first-rate vision care throughout Oregon’s Rogue Valley. They’ve made the shop easy to find, too. Ashland’s downtown can be a daunting place to park, and its business mix caters heavily to tourists. With its location nearby in the Railroad District, Artisan Eyeworks draws both foot traffic from locals who enjoy the more low-key neighborhood, as well as intrepid visitors who like to veer off the beaten path a bit. So it’s not uncommon for people just passing through to find their perfect glasses here — though of course, the Hoyts recommend that out-of-towners get their lenses with the help of their own independent local eye doctor. Whether they come from near or far, people discover Artisan Eyeworks to be a welcoming place. Lots of casual, comfortable seating and a big, colorful rug define a spacious reception area in a storefront that’s been everything from a mercantile to a dance studio where Kimberly used to take classes. The optical blends a variety of display techniques — some showcases, some tiered shelving along brick backdrops — to give frames lots of room to breathe and shine. Optical designer Barbara Wright reviewed their plans and hired local contractor Adam Drost to finish the space. Together, they made the most of the building’s high ceilings and corner light, with multi-hued wood floors and accents plus functionally beautiful fixtures that contribute to the warmth of a place where people are happy to spend time. 1. Wise move. For its branding and logo, the Hoyts hired Mark Mularz of Moodio Design and gave him just one restriction: No eyes. Mularz asked a series of questions such as “If your business was an inanimate object, what would it be?” and “Describe your business in one word, two words, three words,” but he wouldn’t let Kimberly and Michael confer on their answers. He came up with a friendly owl (now dubbed Arty) “because owls are wise and have great vision, but this one is just whimsical enough to represent both of our personalities,” says Michael. 2. Think local. With a food co-op, hardware store, coffee roaster and restaurants nearby (and a yoga studio right upstairs), Ashland’s Railroad District “is really where the local people hang out,” says Kimberly. Artisan Eyeworks, an associate member of the Ashland Gallery Association, takes part in its First Friday Artwalks. 3. Adventurous spirits. The Hoyts spent their 30th anniversary year opening Artisan Eyeworks, then launched into remodeling a nearby home of similar turn-of-the-20th-century vintage. That’s a lot of sawdust and paint in two years, but since home and office are a mere 800 feet apart, the Hoyts now enjoy an especially easy commute. 4. Satisfaction guaranteed. Artisan Eyeworks offers a full, no-questions-asked refund. Michael Hoyt says that in the business’s first year, just one person took them up on it. Michael Hoyt recalls an a-ha moment he had not long after Artisan Eyeworks had passed its first anniversary: “We’re not an optometry office with an optical. We’re an optical with two optometrists,” he says. 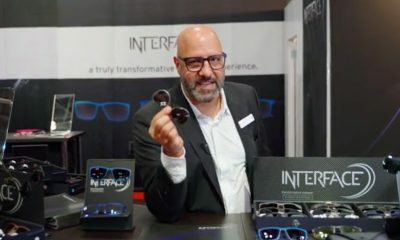 “It’s the optical that drives our business.” About 70 percent of revenue is coming from eyewear, with plenty of people bringing in other doctors’ prescriptions because they can’t find what they want elsewhere. “We also get business that’s totally unexpected, and that’s from the tourists,” adds Kimberly. That was another a-ha: realizing that when people are on vacation, they actually have the most time to relax and have fun shopping. This article originally appeared in the January 2017 edition of INVISION.